If you've ever wondered what being inside the swirling terror of a tornado looks like, watch this video. 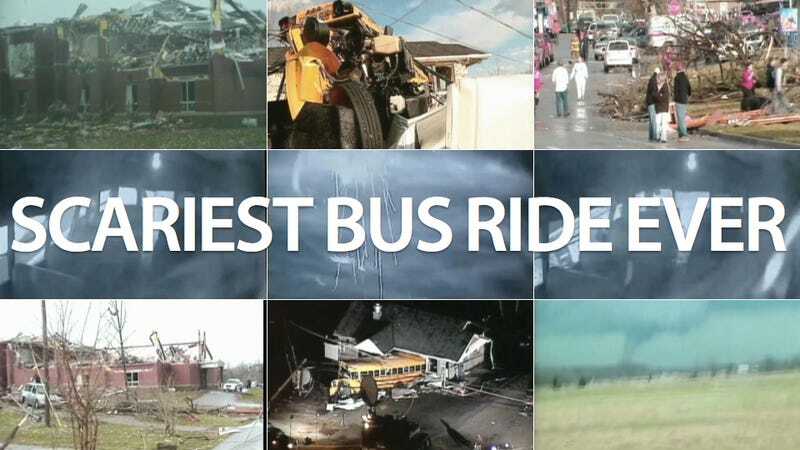 It's footage from a school bus that got trapped inside the destructive spin of the grey cyclone. It's utterly terrifying. The tornado attacks quickly, so watch carefully. Once it hits the bus, it takes less than 10 seconds for Mother Nature to toss the 36,000 pound school bus around like a rag doll and slam it against a building. The concentrated force of the swirling wind of debris and hail is impressive, like a knockout punch. It makes the elongated ground shaking of earthquakes seem like a series of jabs.